Ah, the entitled person. What words come to mind when you think of someone who behaves with ENTITLEMENT? Pride? Arrogance? Selfishness? Expecting the same rules that apply to others shouldn’t apply to you. Believing that because you’re a safer driver than most, you should be allowed to break driving laws. Taking unauthorized liberties to park in spaces you’re not authorized to park in. Feeling burdened when others ask you for favors, but expecting that when you ask for favors, the other person should stop what they’re doing to accommodate your need. Expecting others to be more interested in you and your life, than you are in their life. Seeing your own interests, goals and dreams as more pressing and important than other people’s. Disregarding rules that are intended for everyone’s comfort. For example, ignoring signs to not put your feet on the chairs in the movie theater, or not cleaning up your dog’s poop in public. Inconveniencing others without giving it a second thought, such as canceling appointments or reservations, or making plans with friends and then bailing on those plans without considering that your friend may have organized other plans around fitting you in. Running into a store two minutes before closing without thinking about the fact you’ll be delaying the employees from closing on time. And could you have a sense of ENTITLEMENT at church? Feeling that you should have 24/7 access to your Pastor. Believing that you deserve to be on the worship team because of your gifting, tenure, or anointing. Thinking that you should be allowed to make a special, last-minute announcement during the service. Feeling that you’re entitled to visitor-designated parking spaces. Worship team members who feel that their musical gift excuses them from other types of volunteering. You believe your church title or longevity entitles you to a distinguished seat. You believe your church title or longevity excuses you from physical labor when the church needs help. You want to know—and even designate—where your tithes and offerings go. As a reminder, Christian Boot Camp was designed to teach christians how to behave like Christ. 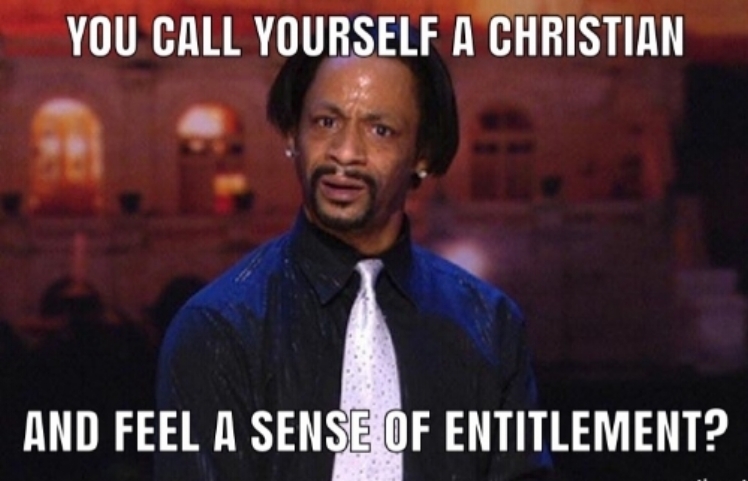 So, what did Jesus say about ENTITLEMENT? Yowch! Jesus is giving us clear warning that ENTITLEMENT doesn’t work with Him. You can be corrected without defending yourself. You rejoice when others are celebrated. No job is too small for you. You naturally seek the advice of others. Your prayers are mostly composed of thankfulness and intercession for others. You freely admit your flaws, mistakes, and failures, and follow a plan to overcome them. You live to help others succeed. You are not easily offended. You have a thankful attitude, both to God—and to people. You don’t live with a sense of entitlement…you don’t feel that anyone owes you something. You are quick to forgive and don’t hold grudges. You are confident in who you are and content with who you are not. God Detests ENTITLEMENT. James 4:6 says, “God opposes the proud, but gives grace to the humble.” What is grace? Simply put, it means favor. And who wouldn’t want God’s favor on their lives? People Detest ENTITLEMENT. Come on, think about it. You know people throughout your life who have acted in ENTITLEMENT. And how did you respond? It was repulsive. It made you sick. So, why wouldn’t people feel the same way when you act entitled? Please don’t think that I’m throwing stones at anyone. The fact is, I used to be an entitled person. While it's embarrassing to admit, I always thought that my church title, tenure, possessions, charisma (and many other perceived attributes too lengthy to list here) entitled me to special treatment. When I came to the realization that being a christian meant that I vowed to die to myself (Luke 9:23), honor others above myself (Romans 12:10), and become a servant to others (Gal. 5:13). And can I be honest? Serving others is way more rewarding than serving myself exclusively. It left me feeling empty. Serving others is much more fulfilling.